28 Days to a Healthier You! 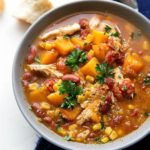 A deliciously healthy broth-based chicken, quinoa, and butternut squash soup made simple in the slow cooker!!! Honestly, this soup will quickly became a staple for the fall season in your home!! It’s extremely easy and super flavorful. You’ll get great reviews from the family! You can change up the flavor with fire roasted petite diced tomatoes for an extra kick. Using squash for this fall favorite gives a flavorful twist and great texture. Lightly grease your slow cooker with nonstick spray ( 6-quart crockpot). Add kidney beans, corn, undrained tomatoes, garlic, and fajita seasoning packet. (OR try a chili seasoning packet if you enjoy those flavors better). Pour in the chicken broth and give everything a good stir. Optional: remove some of the squash and mash it with a potato masher, and return. salt and pepper to taste and any other seasonings desired. If desired, stir in some sour cream and some freshly grated cheese. Chicken Abruzzi is a most delicious dish!!! 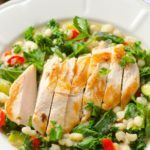 Our version includes grilled chicken breast in a savory broth simmered with cannellini beans, kale and garden vegetables. It is a great option for a late-August or September evening!!! Honestly, the dish is very, very, very good! Crispy veggies floating in a delicious broth, near-raw kale and chicken breast with a no-nonsense sauce. The broth coating everything is “out of this world”. You can use grilled chicken or any leftover cooked chicken. Simmered veggies in broth are cooked but still tender. Add kale at the end and just stir into the vegetable mixture. Finally, using organic cornstarch makes this dish gluten free. In a medium bowl, combine chicken, 1 crushed garlic clove, a pinch of salt and black pepper. Mix to coat the chicken. Preheat large non-stick skillet on medium heat and spray with cooking spray. Add chicken and cook for 7-9 minutes per side or until cooked through. Transfer to a plate and set aside. Return skillet to medium heat, add oil, remaining garlic, and onion,and saute for 1 minute, stirring once. Add zucchini, bell pepper, and saute for 3 more minutes, stirring once. In the meanwhile, make a slurry by whisking together, in a medium bowl, chicken broth, cornstarch, salt and ground black pepper to taste. Pour over vegetables in the skillet and add the beans. Stir, bring to a boil, reduce heat to low-medium and cook for 5 minutes. Remove from heat, add kale, tomato, thyme and optional lemon juice, stir again. To serve, spoon vegetable mixture in a soup or deep plate and place sliced chicken breast on top. Serve hot. 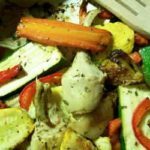 Store: Refrigerate vegetables and chicken separately for up to 3 days. You can use any cooked chicken, grilled or broiled works great. If using canned beans, you might need to add less salt. You may wish to exchange expeller pressed coconut oil for the olive oil. Part of eating healthy is having a good source of healthy recipes on hand to help you cook not only what’s good for you but what tastes good as well. So we’ve decided to use our blog to share some deliciously healthy recipes with you. Be sure to check in with us regularly – more coming soon! A grain-free alternative to traditional pizza crust, that you can pick up with your hands! IF YOU HAVE A JUICER PUT A WHOLE HEAD OF CAULIFLOWER THRU JUICES AND SAVE PULP. You will have about 4 cups. Proceed to step 6 no boiling necessary. Save juice for soups. Now’s the time to add all your favorites– sauce, cheese, and any other toppings you like. For sauce I use 1 cup organic tomato sauce with 1T minced garlic, 1t oregano and 1t basil stirred in. Spread tomato sauce on cooked dough. Cover with broccoli, then mushroom onion mix. Top with goat cheese or mozzarella. . Return the pizza to the 400F oven, and bake an additional 5-10 minutes, just until the cheese is hot and bubbly. Time-Saving Tip: I recommend making a double-batch of cauliflower pizza crusts, make one for now, and save one for later. After baking the crusts, wrap up the extra pizza crust in foil, and FREEZE it for a quick “frozen pizza” to enjoy another night! All you need to do is add toppings and bake at 400F, until the cheese is hot and bubbly. THE LIVE FREE GROUP is a lively, energetic, integrity-based group of integrative health coaches bringing people together from all walks of life who want to seriously improve their health, lifestyles and finances. We want you to know science has proven that poor health and degenerative diseases are preventable. You can achieve good health and you can maintain the changes made and have big results in how you feel and live. Please take a moment to subscribe to our blog, join our mailing list, like us on facebook, follow us on twitter, connect with us on linkedin, google+ and find us on Pinterest. Contact us if you have any questions or to set up a Free consultation. 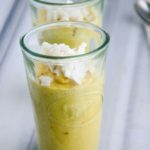 This 5 Ingredient Easy Mango Pudding is quite possibly one of the easiest (and healthiest) desserts you can make. It’s creamy, it’s flavorful and it’s ideal for a weeknight dessert when you’re yearning for a touch of sweetness without any added sugar. There is so much flavor in this pudding, we guarantee you’ll want to make it over and over again! Puree everything in a mini food processor until very smooth and creamy. Stop the food processor and scrape down the sides, if needed. Transfer the pudding to two serving bowls or glasses, garnish with coconut flakes and serve. Tasty roasted vegetables with a sweet, smoky and herby taste. Good for the main course, with quinoa, brown rice, pasta or as a simple side dish. In a large bowl mix the zucchini, carrots, eggplant, tomatoes, onions and capsicum with the oil, rosemary, thyme, bay leaves, oregano, garlic, lemon juice, lemon zest, salt and pepper. Cover and chill for at least 2 hours and preferably overnight. On a large roasting tray roast the vegetables uncovered for 20 minutes or until the tomatoes have split and the edges of some of the vegetables are starting to crisp. Remove from the oven and stir before returning to the oven for another 20 minutes. At this time reduce heat to 95 degrees C and continue cooking until vegetables are tender; turning every 20 minutes. A quick and easy 30 minute chicken soup, cozy and comforting! With cannellini beans for added protein and fiber, this is a very healthy variation on a classic recipe! And the added lemon juice is so refreshing and vibrant! Heat 1 tablespoon olive oil in a large stockpot or Dutch oven over medium heat. Season chicken thighs with salt and pepper, to taste. Add chicken to the stockpot and cook until golden, about 2-3 minutes; set aside. Add remaining 1 tablespoon oil to the stockpot. Add garlic, onion, carrots and celery. Cook, stirring occasionally, until tender, about 3-4 minutes. Stir in thyme until fragrant, about 1 minute. Whisk in chicken stock and bay leaves. 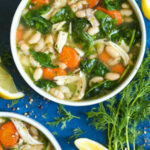 Bring to a boil; reduce heat and stir in cannellini beans and chicken, stirring occasionally, until slightly thickened, about 10-15 minutes. Stir in spinach until wilted, about 2 minutes. Stir in lemon juice, parsley and dill; season with salt and pepper, to taste. 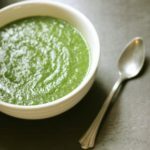 You might be thinking that there’s no way a bright green bowl of pureed veggies can be filling and comforting enough for chilly weather, but this detox soup will prove you wrong. This warming, hearty soup is packed with flavor and detoxifying stars like vitamin A, vitamin C, and fiber. Ingredients like sweet potato and turnip fill you up, onion and garlic add spice, and superfoods kale and spinach make sure you stay feeling your best all winter long. Blend up a batch and get ready to be pleasantly surprised. Saute the onion and garlic in a sauce pan with a little water or stock for 4 minutes. Add the turnip and sweet potato, and saute for a further 3 minutes. Add the rest of the stock, and simmer for 10 minutes. Stir in the zucchini and kale, and simmer for 5 minutes. Add the spinach in at the end, and simmer for another minute. Pour the soup mixture into the blender or food processor, and blend till smooth. Return to the saucepan with heat on low, and add some freshly chopped curly parsley to garnish. Assure good luck as you ring in the New Year, cook up this barbecued black-eyed peas recipe. 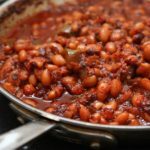 You’ll love it’s smoky and rich flavor, as if it’s seasoned with bacon, but the flavors come from the chipotles in adobo sauce. In America, it’s a tradition to eat black-eyed peas for good luck as we ring in the New Year. Just because they’re beans — a statement of fact, even though they are called “peas” — doesn’t mean they have to be boring. This barbecued baked black-eyed peas recipe is spi-cy (yes, that’s two syllables, because this is a Southern recipe and to emphasize that this will open up your sinuses). It tastes smoky and rich, as if it’s seasoned with bacon, but the flavors come from the chipotles in adobo sauce. We especially love it with grits, millet, or brown rice. Happy (almost) New Year to you and your family! In a large stock pot, combine black-eyed peas with enough water to cover them by two inches. Bring to a boil over medium heat. Skim off any foam, reduce heat to medium-low, and simmer, partially covered, until just tender, about 50 minutes to an hour. Drain beans, reserving cooking water. Meanwhile, in a sauté pan over medium heat, combine oil, onions, and bell pepper. Sauté until the vegetables soften, about five to seven minutes. Add garlic and cook until fragrant, about two minutes. Preheat the oven to 350°F. In a blender, combine the vinegar, lime juice, tamari, tomato sauce, chipotle chile, agave nectar, cumin, thyme, one cup reserved bean water, and three tablespoons olive oil. Puree until smooth, about 30 seconds. 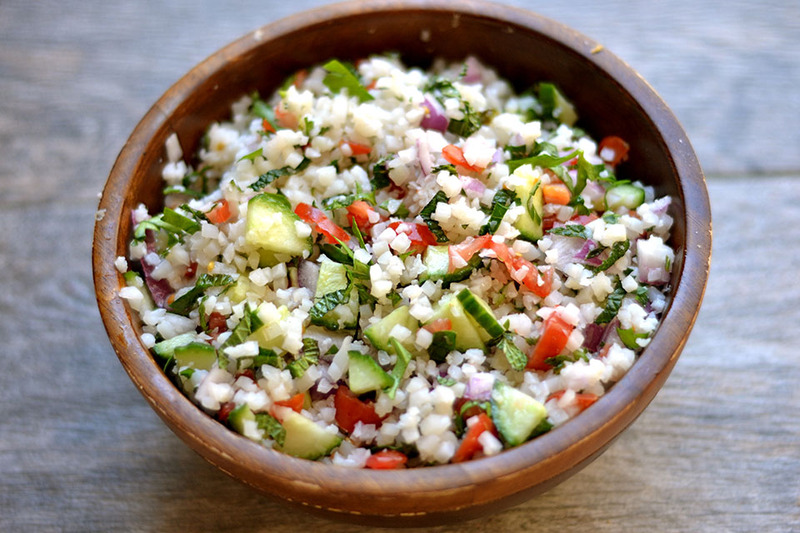 Delicious Tabbouleh Salad that is grain free using cauliflower rice. All the same lemon and fresh herb flavor with an added serving of vegetables!!!! Why cauliflower rice? It’s healthy and more available than ever before! We discovered that Trader Joe’s and other grocery stores now carry Cauliflower Rice in the frozen section and the fresh produce section. No need to rice it yourself! Begin by preparing your cauliflower rice. Use 1 large head of cauliflower and chop into florets. Pulse for about 10-15 seconds in a food processor. You can also use 1 package Trader Joe’s frozen Organic Cauliflower rice and heated in the microwave for 3 minutes. Place rice in a large bowl. Add all vegetables and fresh herbs, and mix well. Whisk together lemon juice, vinegar, oil, salt and pepper. Pour dressing over vegetable mixture and stir to coat. Add more salt and lemon pepper to taste. Serve immediately or refrigerate to let flavors meld. 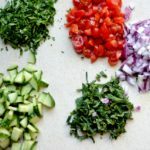 We used red onion, although traditional tabbouleh contains scallions. You can use scallions in place of the red onion. We just enjoy the stronger taste of red onion. The Live Free Group. Copyright © 2014.